Bharatiya Janata Party (BJP) President Amit Shah on Saturday took a swipe at BSP supremo Mayawati, stating she remembers Bharat Ratna Dr BR Ambedkar only during elections. “When it is time for elections, Behenji remembers Ambedkarji. But when she comes to power, she forgets Ambedkarji and builds her own statues,” Shah said while addressing an election rally here. “It is the BJP Government that has built Ambedkarji’s memorial in five years. We have done a lot of works for Dalits in the last five years,” added the BJP President. Reiterating his party’s tough stance on infiltrators, Shah said: “Infiltrators are dangerous for the security of our country. They are eating our country like termites. We will not tolerate this. 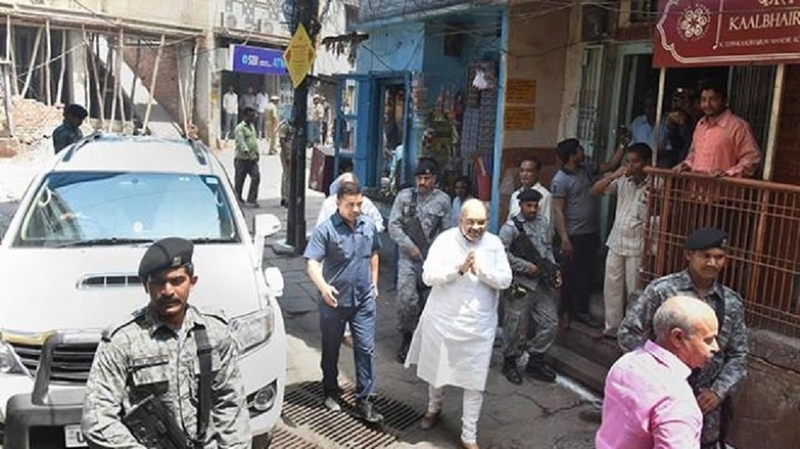 We will ensure that every single infiltrator is thrown out from this country by our party.” Hitting out at Cong, BSP and SP, Shah claimed that these parties could not keep the country safe, and contended that only the BJP could keep the nation safe from its enemies. Accusing the Congress of ignoring the welfare of poor people, Shah said that the leaders in the grand old party were only “interested” in indulging in corruption. “In the last 55 years, Rahul Gandhi and his party did not care for the poor. They did not do anything. In the last two years, UP under CM Adityanath has done a lot of works for poor,” he said. BHARATIYA Janata Party (BJP) President Amit Shah on Saturday accused the Congress of doing ‘Ilu Ilu’ with terrorists, in an apparent reference to a popular Bollywood love song from the nineties. In the song, ‘Ilu Ilu’ is an acronym for I love you. “Rahul baba’s guru Sam Pitorda said do not bomb (Pakistan) but negotiate... Rahul baba if your party wants to do ‘Ilu Ilu’ with terrorists you can do that. But our intention is clear, if a shot is fired, we will reply with a bomb,” Shah said here, addressing a rally in Badaun. Shah claimed that during the Congress’s 10-year tenure, no action was taken even when terrorists took away heads of Indian soldiers. He added that BJP workers in Kashmir will ensure that it remains part of India and intruders are thrown out of the country.